for concert wind band and prerecorded track. Plus, lighting and physical effects, for bands seeking adventure! 44 pages, 9" x 12". The full, downloadable April 2015 live premiere by the University of Memphis Symphonic Band, conducted by Armand Hall. "The most incredible sensory experience occurred before intermission with Alex Shapiro's Lights Out. As the lights dimmed, the musicians lit up with an array of lights covering everything from fingers, to mallets, to the conductor's baton. The crowd gasped, experiencing a collective sense of wonderment at the spectacle ignited by the fusion of light and sound." LIGHTS OUT is available as a physical, bound set of score and parts plus audio download, or as a digital set of .pdf score and parts, plus audio download. 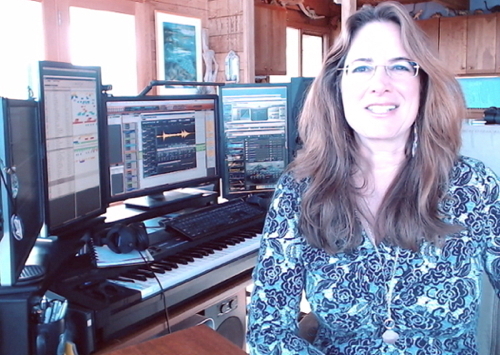 Here's a short video that includes excerpts from some of the Skype sessions Alex did with commissioning ensembles for LIGHTS OUT, from her San Juan Island studio. CLICK to watch what it's like! 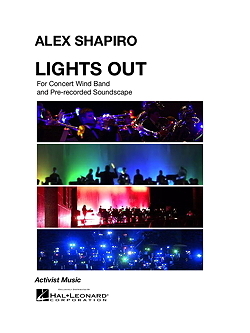 I suppose you could call LIGHTS OUT an "opto-physico-electro-acoustic" work for wind band, because it was conceived from the onset as a visual media piece. 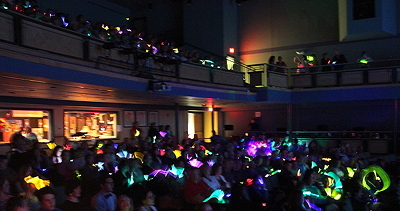 While it can be performed in any normal concert setting, it's most compelling when presented in the dark, slightly disorienting the audience and dazzling them with the beautiful colored aura from glowsticks, smart phones, and small LEDs placed inside the instruments and on the musicians' mallets and fingers. Mesmerizing! Composing this piece, I treated the visuals and movement the same way I treat the audio track— as an equal and additional "section" in the band, organically incorporated into the piece just like the woodwinds, brass and percussion. The physical and lighting aspects of the work were composed simultaneously with the music, and the score includes two additional staves devoted to movement and visual effects, leaving space on the score page for bands to add their own ideas as well. Even before writing a single note of the score, I conducted Skype sessions with the majority of the 19 bands involved in the commissioning consortium, to elicit the musicians' creative ideas about what staging concepts might make a performance particularly unusual and engaging. Roughly 200 of these gems are published in the score, for bands around the world to use and be inspired by. A few screenshots from our sessions can be found on this page. The indications for movement and lighting that found their way into the score due to this wonderful initial collaboration are a jumping off point for many other ideas, and I'm excited to discover what each ensemble is going to choose for their interpretation. I encourage every band to post their performance on YouTube, because each concert will be unique! A Skype session with the students of Keystone School in LaGrange, OH. 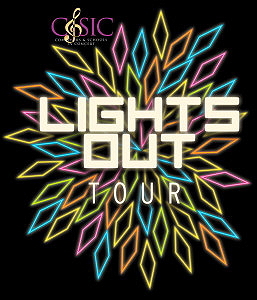 LIGHTS OUT is available directly from this website as well as from Hal Leonard Corp and other retailers. If you would like to see a perusal score, please email Alex for code access. 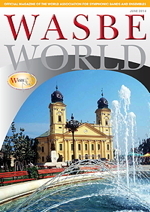 9 x 12; 44 pages including cover and notes. Jim Horwich's Falmouth, Maine audience got into the act, too! The front matter of the score, with detailed notes about the performance possibilities for LIGHTS OUT. Karen Seward's band at the Peabody Conservatory in Baltimore, MD looked like fireflies! 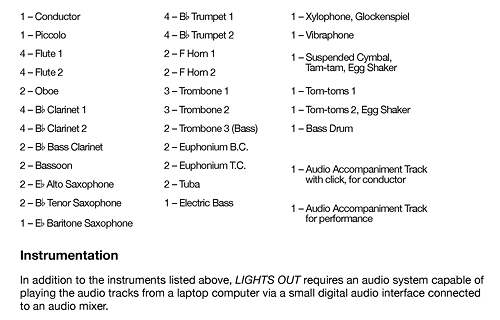 Here's something VERY helpful: a complete guide to the software and hardware setup for your band room and performance venue. A list of resources for finding inexpensive lighting and props is included with every score purchase! 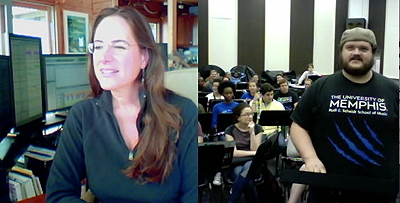 A Skype session with Armand Hall's students at University of Memphis in Memphis, TN. A view from the stage of Armand Hall's 4/29/15 premiere with the University of Memphis Symphonic Band in Memphis, TN. Enjoy the Composers and Schools in Concert March 2013 interview Alex did with conductor Miller Asbill, in which they discuss the nitty gritty of scoring with electronics, rehearsing via Skype, and the true value of electricity. Alex has written a two-part article about electroacoustic band music and the uses of multimedia in the concert world that you might find interesting. 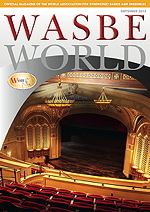 The essay, titled The e-Frontier: Music, Multimedia, Education, and Audiences in the Digital World, appears in the June and September 2014 issues of the magazine of the World Association for Symphonic Bands and Ensembles, WASBE World, and is offered here with the very kind permission of the organization. 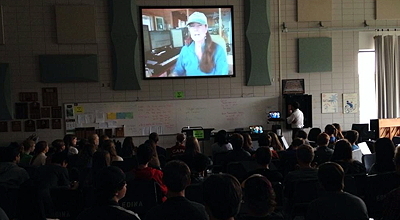 A Skype session with band director Paul Kile and the students of Edina High School in Edina, MN. 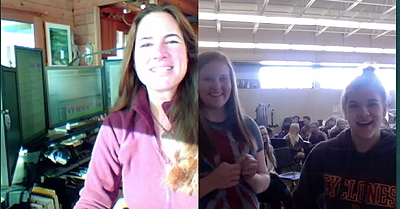 How a Skype session appears from the band's perspective (here, at Edina High in MN). 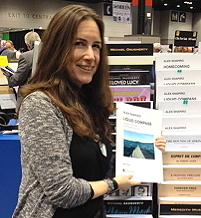 Two of Alex's electroacoustic wind band pieces, TIGHT SQUEEZE, and PAPER CUT, are featured in the book/CD series, Teaching Music Through Performance in Band, Volume 10, edited by Eugene Migliaro Corporon and released by GIA Publications December 2014. 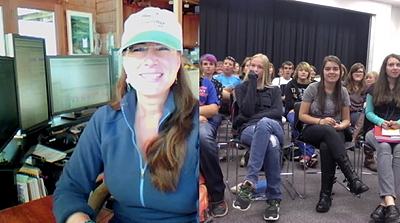 A Skype session with Wade Presley's students at Nevada High in Nevada, IA. The view from the audience during Nevada High's 5/1/15 premiere! Jim Davis's band in Monticello, Iowa, using flickering holiday lights along with LEDs.